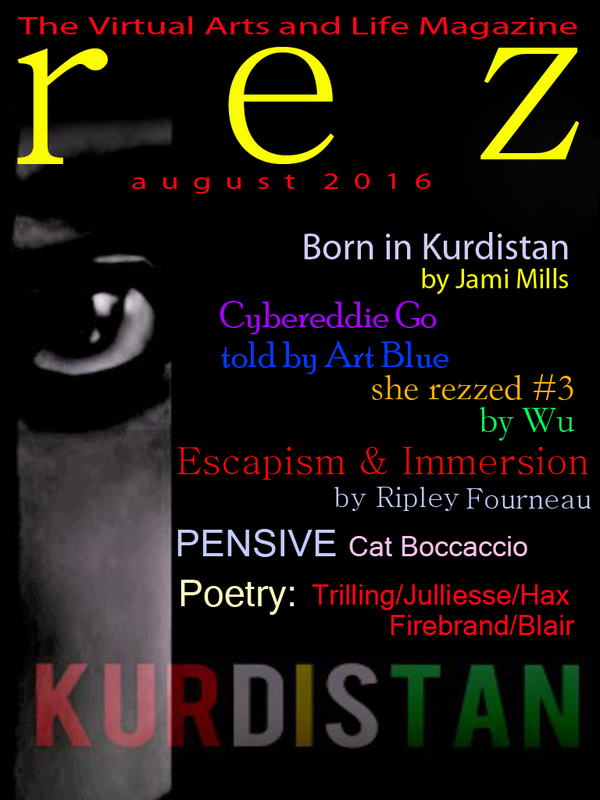 For this month’s cover story, Jami Mills interviews GlitterPrincess Destiny about her art piece, Born in Kurdistan, where the artist captures the amazing images of girls at war against ISIS. It’s difficult to call them girls, as they are feared soldiers of the Peshmerga, itself one of the most ferocious of fighting forces. Glitter brings home the anguish and loneliness of war, a fight for survival against a brutal enemy. Her show will be up through the latter part of August and we recommend it to you. Ripley Fourneau joins us for the first (and hopefully not the last) time with a crisp and insightful piece about Augmentalism, Immersionism, and her own concept of Escapism. All very rewarding reading and extremely thoughtful and well written. 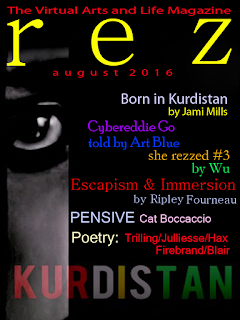 An issue of rez wouldn’t be complete without an article by our very own Art Blue (perhaps plagiarized from his AI owl, Neruval), and this month we have Cybereddie Go, wherein Art chases the elusive Lampas in true Pokemon style. Flynt Firebrand brings us an exquisite poem, Hounded, about the relentless march of memories. In Third Grade, Mariner Trilling hilariously takes us back to those halcyon days of grade school. Spoiler Alert: Mariner swings a mean lunchbox! Jullianna Juliesse contributes two short poems this month, the first being Rebuilding Me, where piece by piece, Julie reconnects herself, and the second being Unhinged, a wonderful poem about another unnamed station. Cat Boccaccio is back this month with a companion piece to last month’s The Accident, this time re-introducing us to Lily-Rose Roades in Pensive, a beautiful short work. 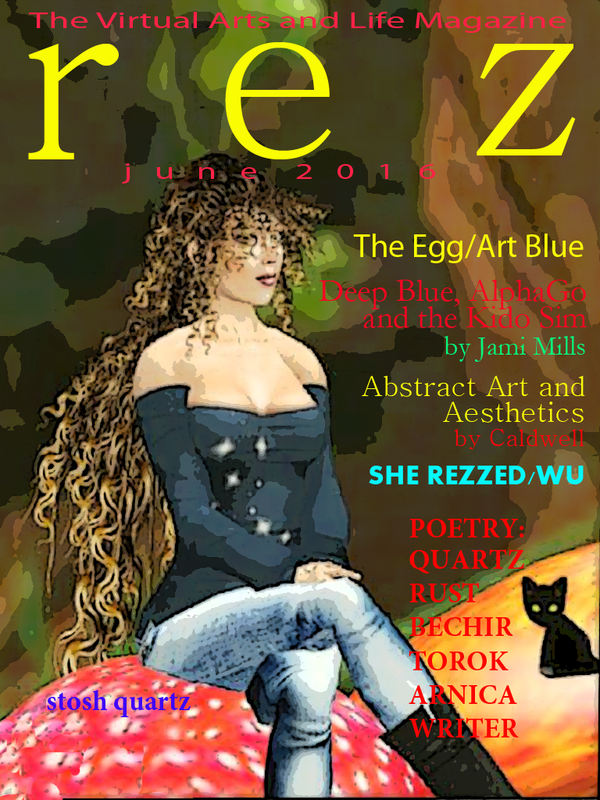 Wu is back for her third installment of the scintillating she rezzed #3. We hope she continues to bring us more of her unique perspective. Adrian Blair also returns with a nostalgic poem about Parisian yearnings. 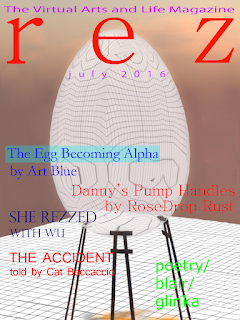 And closing out this month’s issue is a lovely poem by Huckleberry Hax called That Word. I hope you enjoy reading this issue as much as we enjoyed printing it. As we enter the summer months, we’re always looking for some fast-paced reading. 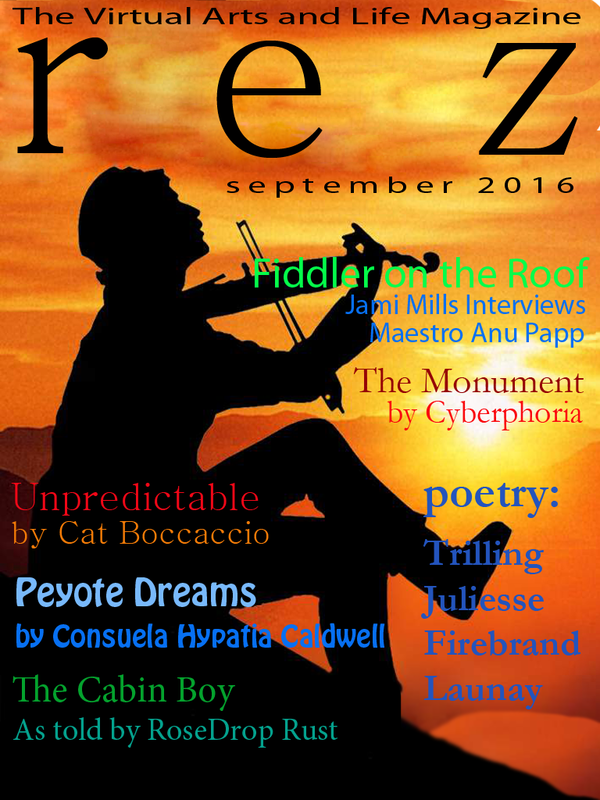 This month is just the cure for the summertime reading blues. We start off with the second half of The Egg by Art Blue, this piece called The Egg Becoming Alpha. Art continues his exploration of the future, where all of us are going, but few others than Art have ever been. Art continues to dazzle us and make us scratch our heads. Please enjoy the month’s omelet. Wu, who began her exciting series, she rezzed, has brought us the second in her series (#2), where we bask in her sumptuous imagery. We’re looking forward to a long collaboration with Wu. 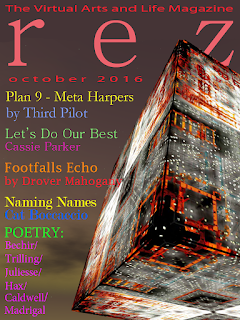 RoseDrop Rust, who has contributed so many wondrous poems to rez, takes his hand at a short story, and what a story it is. Fabulous. We’ve been hoping for a long time that Adrian Blair would contribute another of his stunning poems, this one being Ellipsis, which is a moving piece, full of the tenderness of the human heart. Cat Boccaccio, who you know so well from earlier issues, is back with an exquisite piece of short fiction, The Accident. We’re looking forward to hearing a lot more from Cat in future issues. And bringing the July issue to a close is another beautiful poem by Wolfgang Glinka entitled The Blueberry Cage. I hope you enjoy reading this issue as much as we’ve loved putting it together for you. Enjoy your summer reading! We dedicate this month’s issue of rez Magazine to one of the giants in the world of poetry, Stosh Quartz, who passed away this past month. She touched so many people here, poets and dreamers alike. We’ve reprinted on of her poems, A Young Woman’s Death, which both saddens and uplifts at the same time. She will be missed. 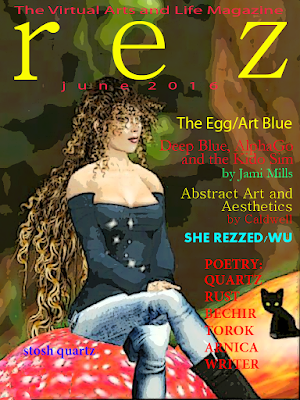 We also introduce this month Wu, who will be writing a series called She Rezzed for as many months as her nimble fingers hold out. Art Blue returns from the future bearing gifts, this month in the form of a wonderful story called The Egg. This is Part One of a two-part series that will conclude in the July issue. Elegy: A Matter of Quartz is a tribute to Stosh beautifully composed by Grail Arnica. Jami Mills explores the state-of-the-art in computer gaming technology, following the exploits of IBM’s Deep Blue and Google’s AlphaGo. She finally ends up at SL’s Go sim, Kido, to bask in its beauty and even picked up a game too. Neeva Torok is another first-time contributor, who has given us a lovely poem entitled Words and Prims. We look forward to many more collaborations in future issues. Bed Blanket is the latest piece by RoseDrop Rust, who muses about unkempt beds. Lucky I’m in Love With My Best Friend is a particularly poignant piece by DonJuan Writer, who knew Stosh better than anyone. Consuela Hypatia Caldwell follows up this month with an essay about abstract art, which as you know from last month’s feature, she has such an affinity for. 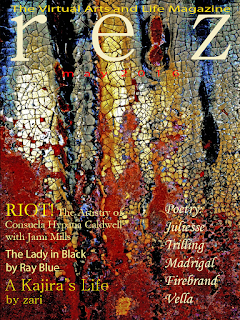 And lastly, serene bechir closes the June issue with a stunning poem, “Poem With Chain Saw Backing.” Please enjoy this special memorial issue of rez. We have a very good feeling about 2016 here at rez. And why not? We’ve been gifted over the years with some of the brightest and most talented artists anywhere. 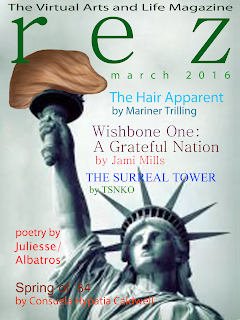 And this is certainly true with rez’s first issue of 2016. 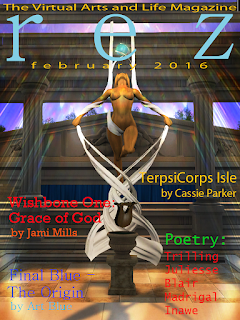 Jami has her head in the stars again and has brought us her third installment of Wishbone One, entitled Selection. Seems as though there’s more to landing a man on Mars than first meets the eye. RoseDrop Rust urges us to fight back against today’s darkness and beat it bloody, in his sharp poem, Beaten Bloody Blues. And joining Jami in the distant future is our very own futurist, Art Blue, who has a two-part installment, Final Art. 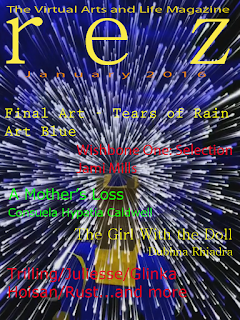 This month’s piece, Tears of Rain, pays homage to Blade Runner, a seminal film in Art’s time-bending work. Poetry Editor (and one of the founding members of rez), Jullianna Juliesse, has a sensational poem, An Invocation Foreboding Fox News, wherein she urges us to leave all of the hatred behind us. Wolfgang Glinka shows us that two is at least twice as good as one by giving us two delightful, short poems, Hot Tub and Alfresco. We liked them so much together, we’ve published them side by side. We have included a parable by poetess and short story writer Dubhna Rhiadra, who spins a tale about a resourceful girl and her devious doll. We hope Dubhna will grace our pages many times in the future. Jullianna's co-conspirator, Mariner Trilling (also a Poetry Editor for rez), skillfully describes what it’s like when you *really* have to go. His Universal Feeling gets right to the point (with an homage to Marcel Duchamp). Not a newcomer to rez, Consuela Hypatia Caldwell holds nothing back with her heartbreaking story of tragedy and redemption, A Mother's Loss. And we close this first issue of 2016 with a stunning poem by our newest poet, Karima Hoisan, who brings us to the edge of our seats with The Voice of Annihilation. Here’s to a wonderful 2016. We hope you’ll enjoy every issue as much as we do. Happy New Year from the staff of rez.